A robbery from a convenience store in Wendover, in which the offender was armed with a machete, is being linked with similar incidents over the weekend elsewhere in the Thames Valley. At around 11.30pm on February 17, a man entered Tesco Express on Tring Road, Wendover, armed with a machete. He demanded money from the safe and made off with cash from the store but thankfully nobody was hurt. In the early hours of the following morning (Sunday) two incidents occurred in Buckinghamshire and Berkshire. In the first at around 5.45am a man entered the One Stop on Marlow Bottom Road, Marlow, armed with a small handgun and demanded money. The offender was unable to access any cash from the store and so made off - nobody was injured. Then just under an hour later a man entered the Co-Operative on Wokingham Road, Earley, armed with a small handgun. He made off with cash from the store - no-one was injured. In all three incidents the offender is described as a black man, of chubby/large build, around 30 to 40 years old, around 6ft tall, with a face covering and wearing blue jeans, a dark coloured hat and dark clothing. Senior investigating officer Detective Inspector Mark Carolan said: “We are carrying out a thorough investigation into these incidents that at this stage we believe to be linked. “These incidents were very traumatic for those involved. “In order to assist us in our investigation we would ask anyone with any information to come forward and contact us. “If anyone has a dash cam and was driving past any of these locations around the time of these incidents then we would ask you to check the footage and come forward. 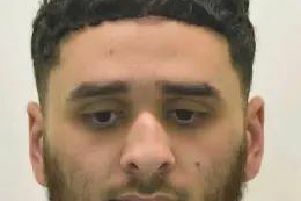 Hamza Ali escapes from Springhill Prison, have you seen him? “If anyone has any information we would ask them to call 101 quoting reference 1688 of 17/02/18.